Dino Babers has been rumored to be heading to UCF but nothing is official yet. Will that be a distraction? It could but I also think that the Falcons are the superior club here. Both of these teams have coaches that have been mentioned for other jobs, although Tom Herman appears to be staying in Houston. Temple's defense will keep them in the mix but their mediocre offense is no match for the Cougars. Both of these teams score a lot of points and run up a lot of yards so we know that offense will be plentiful. A quarterback matchup of Nick Mullens and Brandon Doughty will also be very fun. I do think that WKU is the slightly better team and playing in front of the home crowd will certainly not hurt. The powers that be would love Georgia State to pull the upset so that they become bowl eligible, but it won't happen. Trent Miles deserves credit for getting the Panthers to that point, however. The Gators have looked, frankly, pathetic offensively over the past several weeks and so I don't see how that will change this Saturday in the Georgia Dome. K-State may get to a bowl even with a loss but I think they have shown enough game to get one the old-fashioned way. Another team that could get bowl eligible with a win is South Alabama, but I don't see them pulling a home upset. Troy Calhoun's offensive attack is one that is tough to stop, but the Aztecs are strong enough defensively to keep them at bay at home. I like SDSU. If Stanford can get some help and look very impressive here, they may have an outside change to get to the Playoff. I don't see that happening but I do see them winning here. It will be their defense that will be the difference. This is a de facto play-in game for the CFB Playoff. 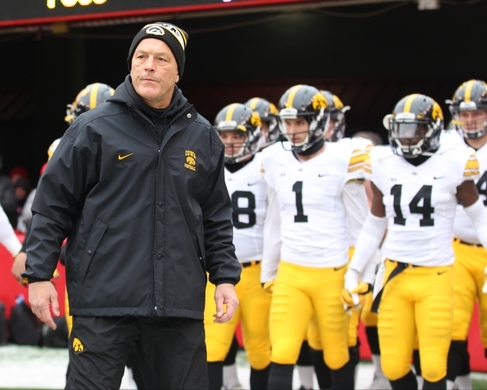 Iowa does not have a blemish on their record but while they are a good team, they really haven't had many impressive wins over the tough competition. Their running game gives them a shot but I think that the Spartans are the superior club. This has the potential to really be a fun one, and the Tar Heels may just get into the Playoff with a win. Even with their excellent offense and an underrated defense, they just aren't battle-tested like the Tigers are, nor do they have the same talent-level. Just curious, but what's your opinion on Georgia letting Richt go on Sunday? I understand that there can be some malaise in a program when a coach is around for a long time but I didn't like the firing at all. I think that schools can get a little too greedy at times with coaches that won 9, 10 games a season but not a national championship. First off, titles aren't grown on trees and second, there are countless examples of teams firing a coach who won plenty but not enough, and then the next guy comes in and the program slides a little. Richt has a higher win percentage than the great Vince Dooley, mind you. And I always say, if you are going to fire a coach you have to bring in somebody better. I'm not certain that will happen here.